Do you end up with a lot of tins leftover from holiday goodies? Mod Podge them with fabric – it's the perfect way to reuse cookie tins. SO easy! With the holidays over, you may have a very important question: how to reuse cookie tins? Our family seemed to get loads of nice tins this year for Christmas filled with cookies, nuts, and other goodies. I really hate to throw nice metal containers out – they are way too perfect for recycled craft projects! So I don't throw them out. I keep the tins and decoupage them with leftover fabric. In case you were doing the math in your head, that is a grand total of $0 spent. If you're wondering how to recycle cookie tins, this is a great idea. Here's how I did it. This first step is optional. If you have cookie tins with dark patterns on them on your fabric is kinda thin, you might want to paint the container. I did that with this green and black container so that the pattern doesn't show through the fabric. 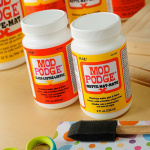 The next step is to prepare you fabric with Mod Podge. This will make it easier to cut without fraying, and easier to apply to the container smoothly. Simply paint a medium coat of Mod Podge on the fabric and let dry. Once the fabric is dry, cut one edge to be straight. You will use this as your reference. Place your fabric on the container and measure where you need to cut at the top. I didn't even use a ruler, but you can. I just marked it with my finger. Once you do this, cut to fit the container. 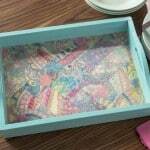 Place a medium layer of Mod Podge on the container and then carefully wrap the fabric around, smoothing as you go. Let it dry for 15 – 20 minutes. Paint several coats of Mod Podge on the outside to seal. I didn't paint onto the tin, but you can. I just wiped the Mod Podge away if it got onto the tin. Yes, I am a messy crafter. The lid is WAY easier than you think. Place the lid flat onto the back of the fabric and trace with a pencil. Now you have a circle on the fabric. Cut about 1/2″ extra around the circle on the outside – so you are cutting a larger circle than you traced. Why did you do this? 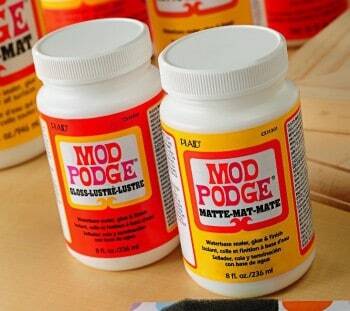 Because you are going to Mod Podge the circle to the top and then cut the overhang and fold it down. You can see how I did it in the picture. Do it all the way around the lid, cutting and Mod Podging. Trim off extra with scissors. Add ribbon to the rims of the lids and buttons to the tops. If you want to. Your dream of recycling cookie tins is complete. You now have fancy containers, and you can feel good because you've done a recycled craft. You can reuse cookie tins for all sorts of things, but I like them in the craft room. Enjoy! 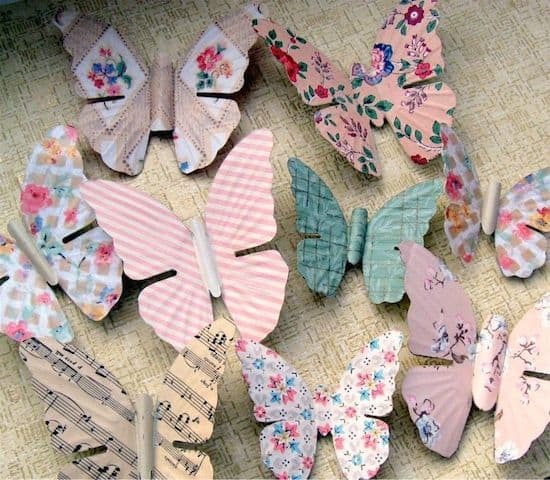 Are you wanting to recycle more items in your home using decoupage? 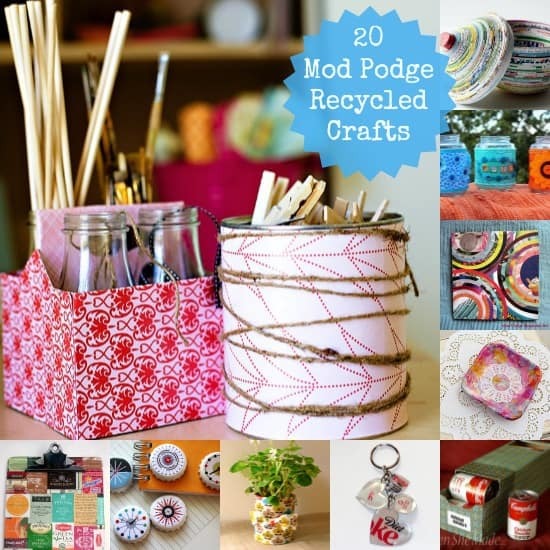 Click below to get 20 Mod Podge recycled crafts! Eeeeexcellent tutorial! Thanks esp. for the details about covering the lid – now I feel like I can do this! These are super cute! i’m always looking for new organizational tools! These are great for “stuff”! Wow! Never knew about preparing the fabric with the MP first. So helpful! Thanks for posting! 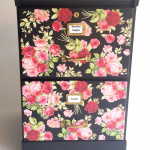 Great project Amy, love upcycling tins, who could throw them out? And I even have some of that green fabric too….well maybe I had some, it was just a little fat quarter’s worth from JoAnnes. Thanks so much for sharing on Craft Schooling Sunday, great to see you! Great idea, I have some tins I want to reuse and was just going to cover them with fancy paper, I never thought about using fabric but I will use that instead now – thank you 🙂 It’s also a brilliant way to use up all the left over pieces I have lying around! What a simple way to make something personalized! Thanks for the idea, I would love for you to share this at my link party! Great idea! I am decorating a “new to me” house, and doing my master bath in zebra with red & turquoise accents. I also keep all my old tins and have used paper in the past, but this will work great! I also want to do the wall behind the garden tub with zebra…think I could mod podge it on the wall? Hi Trea! 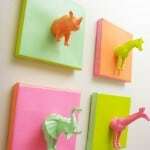 You can definitely Mod Podge to the wall! Just treat it like you are Mod Podging to wood. Also, if it’s right behind the tub and could be exposed to water you will need a waterproof sealer to go on top. Good luck!